Is A New Patapon One Of Sony's E3 Surprises? Countdown clocks... we love 'em! The makers of Metal Gear Solid, Burnout and Banjo Kazooie all have countdowns ticking away on their respective sites. Sony has one too, less subtly teasing what appears to be a brand new Patapon game. This particular countdown clock teases an impending beta test and appears to feature some hidden Patapon-like imagery. Could that mean Patapon 3? 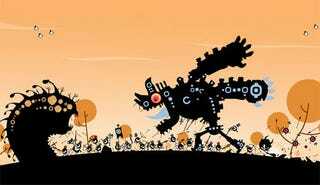 Patapon for the PlayStation 3? Patapon with PlayStation Move support? Something far more boring? We'll keep an eye on it, but won't be surprised if that countdown clock gets spoiled by an E3 press conference announcement or an early Famitsu leak. Best guess and greatest wishes are welcome in the comments.